The Centers for Medicare & Medicaid Services (CMS) will start mailing redesigned Medicare cards to beneficiaries in Washington state after June 2018. The new card contains a unique, randomly assigned number that replaces consumers' Social Security numbers. The purpose is to prevent fraud, combat identity theft and safeguard taxpayer dollars. All replacement cards should be delivered nationwide by April 2019. Mailing takes time: Your card may arrive at a different time than your friend’s or neighbor’s. Destroy your old Medicare card: Once you get your new Medicare card, destroy your old Medicare card and start using your new card right away. Guard your card: Only give your new Medicare number to doctors, pharmacists, other health care providers, your insurers, or people you trust to work with Medicare on your behalf. Your Medicare number is unique: Your card has a new number instead of your Social Security Number. This new number is unique to you. Your new card is paper: Paper cards are easier for many providers to use and copy, and they save taxpayers a lot of money. Plus, you can print your own replacement card if you need one! Keep your new card with you: Carry your new card and show it to your health care providers when you need care. Your doctor knows it’s coming: Doctors, other health care facilities and providers will ask for your new Medicare card when you need care. You can find your number: If you forget your new card, you, your doctor or other health care provider may be able to look up your Medicare number online. 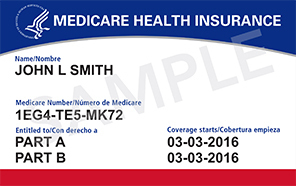 Keep your Medicare Advantage card: If you’re in a Medicare Advantage plan (like an HMO or PPO), your Medicare Advantage plan ID card is your main card for Medicare – you should still keep and use it whenever you need care. However, your medical provider may also ask you to show your new Medicare card, so you should carry it too. Help is available: If you don’t get your new Medicare card by April 2019, call 1-800-MEDICARE (1-800-633-4227). TTY users can call 1-877-486-2048. You can also find help in Washington state from SHIBA advisors in your area by calling 1-800-562-6900 or online.